We had to produce all these between 9:30 and 1:30, including a 30 minutes lunch break. 1:30 time stamp was written by the chef instructor indicating the time I finished all 3 items. I literally completed just on time with not even one minute to spare. It was quite a scramble...but I am happy that I made it. Now I am truly looking forward to the long weekend. Wow. Sounds like one of those Iron Chef shows. Hope you're mellowing out this weekend. 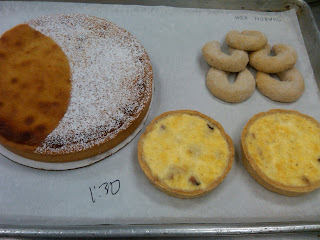 A.
Tarts, Tarts and more Tarts!